Few days after it hosted a sensational end of year service experience tagged RESET; Harvesters International Christian Centre announces its 2016 Winepress Summit to hold from Saturday the 16th to Sunday the 24th of January 2016. Alongside the host and convener of the summit, Pastor Bolaji Idowu, Senior Pastor of Harvesters International Christian Centre, is an array of great ministers which includes: Rev. Sam Adeyemi(Daystar Christian Centre),Rev. George Adegboye(Rhema Chapel International Churches) Dr. Abel Damina (Abel Damina Ministries International), Rev. FunkeAdejumo(Agape Christian Ministries),NiyiEboda (Harvest House Christian Centre) and DotunArifalo (Kingsword Ministries). With the New Year comes new plans, resolutions, ideas and desired behavioral changes. As humans, there is a desire to advance from our current level to a higher level; advancement in our career, personal lives, business scope, financial level and marital life. Winepress is an annual summit where we God is met and your direction for the year is set. 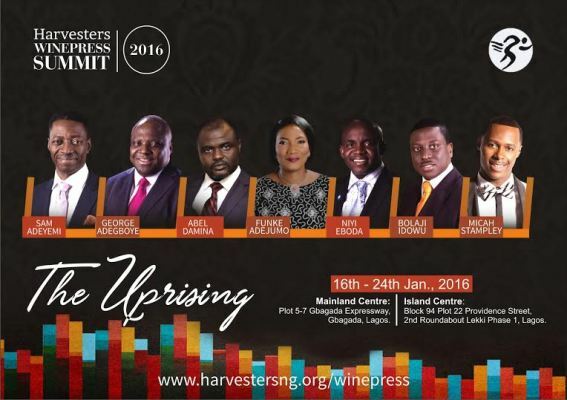 This year’s winepress summit is themed “The Uprising”. It promises to be impactful, empowering and a time of spiritual refreshment for thousands of attendees. Coupled with spirit-filledmessages will be heaven-touching worship led by the Stellar Award winning artiste, Micah Stampley (USA).